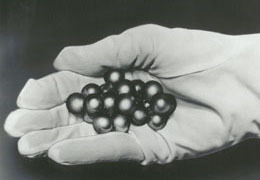 THE 4.00 INCH (101.6 MM) DIAMETER MAGNETIC PLATFORM WAS DEVELOPED TO HOLD THE TARGET SPHERE FOR EVALUATING COMPUTER NUMERICALLY CONTROLLED MACHINING CENTERS ACCORDING TO ANSI-ASME B 5.54-1992. THE COMMONLY USED TARGET SPHERE IS A 1.00 INCH (25.4 MM) DIAMETER ULTRA PRECISE SPHERE MOUNTED ON A 1-1/4 INCH (31.75 MM) DIAMETER POST, (PART NUMBER PM-UB-B100, SEE TECHNICAL DATA SHEET CMM-7). 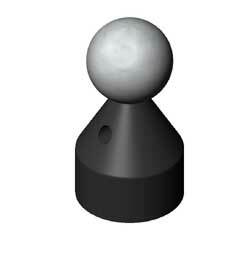 ANOTHER POPULAR TARGET SPHERE THAT IS COMPATIBLE WITH THIS MAGNETIC PLATFORM IS THE "BIG ONE". IT IS PARTICULARLY WELL-SUITED FOR THE EVALUATION OF LARGE AND MULTI-SPINDLE MACHINES. THIS DEVICE (PART NUMBER PM-PB-B 200, SEE TECHNICAL DATA SHEET CNC-1) INCORPORATES A HUGE 2.00 INCH (50.8 MM) DIAMETER SPHERE MOUNTED ON A ROBUST 2.00 INCH (50.8 MM DIAMETER BY 2-1/2 INCH (63.5 MM) HIGH STEEL POST. THE SURFACE AREA OF THIS SPHERE IS FOUR TIMES AS GREAT AS THE AREA OF THE STANDARD 1.00 INCH SPHERE. THE SURFACE AREA OF A 1.00 INCH (25.4 MM) SPHERE IS 3.1416 SQUARE INCHES (79.797 SQUARE MM) AND THE SURFACE AREA OF THE 2.00 INCH (50.8 MM) DIAMETER SPHERE IS 12.566 SQUARE INCHES (319.18 SQUARE MM). 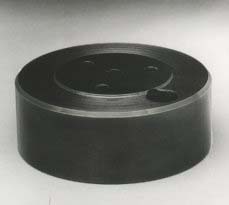 THE 4.00 INCH (101.6 MM) DIAMETER MAGNETIC PLATFORM (PART NUMBER M-PLT-4) IS 1-1/2 INCH (38.1 MM) THICK AND WEIGHS OVER 5 LBS. (2.27 KG). A RARE EARTH MAGNET PROVIDES A HOLDING FORCE OF OVER 100 POUNDS (45.358 KG). TWO PASS-TIPPED JACK SCREWS ARE PROVIDED TO ASSIST IN REMOVING THIS POWERFUL PLATFORM FROM THE MACHINE SURFACE. AS THE JACK SCREWS ARE ADVANCED, THE SOFT PASS TIPS PRESS AGAINST THE MACHINE SURFACE AND SMOOTHLY RAISE THE MAGNETIC PLATFORM. IT IS PROVIDED WITH A 3/8 INCH BY 16 THREADS PER INCH TAPPED HOLE IN THE CENTER OF THE TOP SURFACE AND ONE NEAR THE OUTER EDGE. THESE THREADED HOLES ON THE DEVICE ARE USED TO RIGIDLY COUPLE THE VARIOUS APPARATUS USED WITH THE PLATFORM. THE TOP SURFACE OF THE MAGNETIC PLATFORM IS MACHINABLE, SO THAT ADDITIONAL THREADED HOLES OR OTHER DETAILS CAN BE ADDED FOR SPECIFIC APPLICATIONS. WE WILL PROVIDE PROMPT DELIVERY OF SPECIAL MACHINED DETAILS TO YOUR SPECIFICATIONS. THE DEVICE IS PROVIDED WITH AN ATTRACTIVE BLACK OXIDE FINISH THAT RESISTS CORROSION. THE 45 DEGREE ANGLE BLOCK ( PART NUMBER BLK-45, TECHNICAL DATA SHEET CMM-11) AND BOTH THE THREE INCH ( 3.00", 76.2MM ) LONG ( PART NUMBER P-EP-3 ) AND THE SIX INCH (6.00", 152.4 MM) LONG (PART NUMBER P-EP-6 ), 1-1/4 INCH ( 1.25", 31.75 MM ) DIAMETER EXTENSION POSTS ARE COMPATIBLE WITH THIS PLATFORM. BOTH THE 3.00 INCH (76.2 MM) LONG (PART NUMBER BO-EP-3), AND THE 6.00 INCH (152.4 MM ) LONG (PART NUMBER BO-EP-3 ) 2 INCH (50.8 MM) DIAMETER EXTENSION POSTS ARE ALSO COMPATIBLE WITH THIS PLATFORM.